It all started with the Series 1 Land Rover 80", although when it was introduced in 1948 it was just called "The Land Rover". The first Land Rover was smaller than all later models, but it was adaptable and durable, quickly becoming a familiar sight in the UK and overseas. This capable vehicle was created as more of a 'stop-gap' to match Rover production requirements, rather than to meet a specific existing market. The Rover Company started off in the mid-1800s selling sewing machines and then 'Safety' Tricycles and Bicycles. By the 1930s, it had evolved into a car company but was hit badly by the Depression. In common with many British industrial companies during World War 2, its factories were turned over to the war effort and produced engines for tanks and aircraft. By 1945 and the end of World War 2, Rover found itself with two excellent factories and a highly skilled workforce. It was looking at restarting car production and produced ambitious plans to build 20,000 cars per year. A new model, the 'M'-type was dropped when it became clear that it would be unsuitable for export and that tooling costs would be excessive. Plans to produce 15,000 of the pre-war designs per year were quickly quashed by the Government which refused to allocate steel for more than 1,100 cars per year. This serious short-fall led Rover to realise that a stop-gap solution was required until sufficient steel was available. The stop-gap also had to have export potential. Just to make things difficult, Rover had never exported any vehicles before! In the 1940s, Rover's Managing Director was Spencer Wilks, and his brother Maurice was the Chief Designer. Maurice Wilks owned a farm in Anglesey that also had a war surplus Willys Jeep. Although very beaten up, the Jeep proved to be a very useful vehicle for small jobs around the farm. Seriously in need of replacing, Maurice Wilks had a problem. Although further war surplus jeeps were available, they were in a similar condition. Spare parts could only be purchased in bulk, and new Jeeps were not being exported from the US to the UK. Besides, the British Chief Designer balked at the idea of buying a non-British vehicle, and commented that if he could not build a better vehicle he should not be in the business! This was the beginning of a the project to build a Rover for the Land, ie. a Land Rover. The idea formed in early 1947, and early prototypes were running during summer 1947. At a Board Meeting in September 1947, this new vehicle was described as an 'all-purpose vehicle on the lines of the Willys-Overland post-war Jeep'. Although similar to the Jeep, it was designed to be more useful to the farmer. It had greater utility as a power source being able to drive things, have lots of bolt-on accessories, and "to have power take offs everywhere". Tooling was also minimised by using existing Rover parts where possible, and using body panels that could be made with simple folds. The existing P3 engine, gearbox, and back axle were used. Design and planning were rapid with a concept that did not exist before 1947 being exhibited to the public by April 1948. This was mainly because a workforce was waiting to be employed, and Rover desperately needed the export ability. The severe shortage of steel, meant the body panels had to be made of aluminium - a distinctive feature that would be repeated in many later Land Rover products. Early prototypes used the 1.4l Rover 10 engine, but this quickly demonstrated a lack of power; and a new high torque 1.6 litre engine was fitted. The gearbox was fitted with a transfer case and four wheel drive unit, as well as the ability for a variety of power take-offs to be fitted. Rover did not know what to expect at the Amsterdam Show in 1948, but they need not have worried. Enthusiasm was displayed in all quarters and was quickly followed by very serious interest and the order books quickly over-flowed. The new vehicle could be used as a car, but also as a power source and even small tractor. It had excellent off-road abilities - perfect for the farmer. Demand for this stop-gap measure was amazing. In the first full year of sales, 8000 Land Rovers were sold compared to a target of 5000. By 1951, Land Rovers were out-selling Rover road cars by a factor of two to one. Something that was not fully anticipated, was the fact that the Land Rover was adaptable to a huge range of markets other than farmers. Quickly it was being used by police forces, armed services, building contractors, rescue services, electricity boards, and expeditions. In 1952, it was decided to have the four wheel drive engage automatically when the low gear range is selected. This was performed with a simple dog clutch mechanism that would be used on all later Series Land Rovers. The gear box was also slightly re-designed to handle the more powerful 2 litre engine that was introduced at the same time. A 7-seat station wagon version was also introduced. Although a very popular and useful vehicle, the early Land Rovers were criticised for having a small load space. This was addressed in 1954, when the 80" Land Rover was replaced with an 86" wheelbase version. 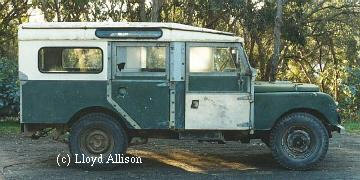 A "long wheelbase" 107" Land Rover was also introduced. These new models proved expensive, with a surprising number of new parts including new prop-shafts, springs, exhaust, and body panelling. The new models would only last two years. Demand had grown for a diesel engine option, and another two inches had to be inserted to allow space in the engine compartment for the new engine option. This space was inserted between the front axle and the toe board, adding to the wheelbase. In the event, the new wheel bases of 88" and 109" were launched in 1956 but the diesel engine option would not be launched until 1957. Due to production line capacity constraints, the 107" vehicle would remain in production as a station wagon until 1959 when the 109" Series II Station Wagon was launched. As well as the advent of a diesel option, 1957 saw the arrival of fully floating half-shafts on the long wheelbase 109" vehicle. The Land Rover had a very successful first ten years, but by the late 1950s it was clear that changes would have to be made if it was to remain the top dog. Larger engines and improved body styling saw the Land Rover re-launched as the Series II in 1958. What had previously been known simply as the "Land Rover" was forever renamed as the "Series I Land Rover". Many hundreds (if not thousands) of Series 1 vehicles survive. Membership of the Land Rover Series One Club is almost essential for all owners. As well as the usual club activities and newsletters, the club is an excellent source of information and parts - including parts produced especially for the club. 107" station wagon photograph: © Lloyd Allison.